Another pair of socks for grandchildren. This time for Miss Pink, alias Miss Five who wants any colour, "so long as it's pink." I love rich purples but I'm not a pink person. 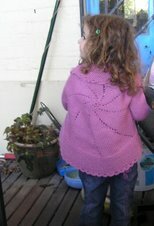 This little girl chose a warm top for me when she was at some markets in Canberra, pale pink. The top is a useful style,I wear it a lot around the house on cooler evenings, but I would not have chosen it for myself. Still I remember she apparently insisted to her parents that they needed to buy something for me, so I'm grateful to her and wear it remembering she chose it with love. I also chose this colour with love and knitted it likewise. 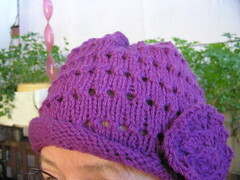 Ii was heartily sick of shades of pink when I had finished, although they were a quick knit. I wasn't going to bother making them identical, or close to, but the dark stripe stood out so much I really had to. Heirloom Jigsaw and I don't now whether I would bother with it again. I like Heirloom Argyle and wish the colour range was greater, but this wasn't cheap. I found it just so-so and look at the patterns in the stripes. Although the socks are mirror reversed, it's obvious that the pattern within bands is nowhere near the same on some colours. Stitch count hasn't changed to influence it. I am sure these socks will be very much appreciated! It shows that you were knitting with her in mind - even if you wouldn't personally wear that colour! i love them. color and all!!!! I'm with Kreativemix - I'm not a pink person but I love their bright playfulness. Just right for a young princess. And "fraternal twin" [as opposed to "identical"] socks is very acceptable these days. No-one is really going to look that closely, especially if the wearer is constantly on the go, as 5year olds tend to be!